There are two schools of thought regarding English Ivy. One says it's a beautiful and wondrous work of nature and should be left to grow according to its own inclinations. The other says it's a pretty weed that will take over your house and destroy it if it’s not controlled. The Lady BG is of the former, and I of the latter. For several months I've been watching the ivy, ever so slowly, swallow up the CowChows. We've had many discussions about taking it down but somehow it always remained, until yesterday. I finally managed to convince the Lady BG that it was time to curb its enthusiasm. And so, I drug out the big ladder and dug out the loppers and the nippers and prepared to take my house back. Properly prepared and outfitted I began my assent up the ladder. The Lady BG blew me a kiss from the front porch and admonished me, once more, to be careful. In retrospect, I think it was the stocking cap that was my undoing. Had I not pulled it down over my ears I might have heard the angry buzzing before I reached the top of the ladder. Instead, I was fully entangled with the ivy before I realized I had just disturbed a battalion of paper wasps. The good news was that it was too cool for them to swarm me; the bad news was that they didn't need to. As I was already entangled with the ivy all they had to do was crawl onto my hands and arms, the same hands and arms that I was using to hold onto the ladder. I'm a little blurry on the details after that. I remember thinking some stuff that I probably shouldn't say out loud. Although, the Lady BG says I was thinking them at the top of my lungs. I remember seeing and feeling the wasps crawling on my skin, and I remember flinging my arms and swatting at them. I remember the fire as the first stinger was plunged into me. I remember their hysterical screams; although, the Lady BG says that might have been me. I remember starting down the ladder. 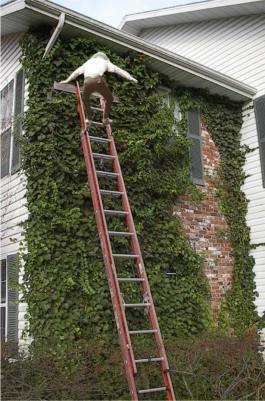 And, I remember the exact moment when I realized the ladder was gone. I remember the blue sky as the world seemed to rotate around me, and I remembered the holly hedge and its needle sharp leaves at the foot of the ladder, and I remember thinking, "Oh crap, this is gonna hurt." Thankfully, the holly hedge broke my fall and its leaves punctured no vital organs. I hit the ground with a "Thud," that drove all the oxygen out of my lungs and I guess I blacked out because the next thing I knew the Lady BG was cradling my head and calling my name. I opened my eyes and the world slowly swam back into focus, and then I could see her angelic face hovering over me. She was saying something but my addled brain couldn't make sense of it. I shook my head to try and clear it, and I tried to smile to assure her that I was okay. Finally, her words pierced the fog and came to me clear and unmistakable. "What do you think of the ivy now?" "I love it," I croaked as she let go my head and it hit the ground. Tuesday, November 16, 2010: Friend Lodge No. 352 will meet in Special Communication for work in the 3rd Degree of Freemasonry. Brothers Charles Burgess and Warren Hagar will be presented for the sublime degree of Master Mason. Dinner at 6:00; Lodge will be duly Opened at 6:30 PM. Tuesday, November 16, 2010: Table Rock Lodge No. 680 will meet in Special Communication for work in the 3rd Degree of Freemasonry. Two candidates will be presented for the sublime degree of Master Mason. Dinner at 6:00 and Lodge will be duly Opened at 7:00 PM. Friday, November 19, 2010: In conjunction with their Stated business meeting University Lodge No. 683 will receive one, and possibly two, candidates for the sublime degree of Master Mason. Dinner at 6:00 and Lodge will be duly Opened at 7:00 PM. Saturday, November 20, 2010: A Chance-to-Advance (C2A) one day class will be held at the Gate of the Temple Lodge building, 1700 N Boonville, Springfield, MO. This C2A will be hosted by Solomon Lodge No. 271. Breakfast at 6:30; registration will begin at 7:00 AM and Lodge will be duly Opened at 8:00 AM. All Master Masons are encouraged to attend and assist in bringing more Light to our advancing Brethren.